Do I Dare Write In Front of My Students? I get to teach a writing methods course next semester that I am really excited about. A whole semester devoted to teaching writing! In my professional life, I taught social studies but we wrote A LOT in my classes. And not just writing-to-learn, but historical fiction, opinion pieces, and perspective writing in a lot of different genres. I am currently searching for a textbook for the course and I have been reading and skimming through some key texts to find a good one. 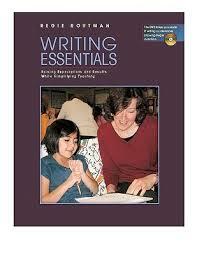 I was browsing Writing Essentials by Regie Routman today when I came across her chapter on writing in front of your students. Pedagogically, I understand why this is sound advice. Students need to see you struggle with writing because they learn better from watching someone work through it as opposed to seeing a perfect product. I liken this to cooking shows on TV. They always start mixing ingredients for a minute and then magically pull out a perfect, finished product. Nobody ever tells you what happens if the sauce starts looking funny or if your cake won’t rise in the middle, which is of course what always happens to me. I need to watch someone struggle to learn what to do when I inevitably get stuck. Clearly, I want to tell my pre-service teachers to write in front of their students. But maybe that’s not good enough. Maybe I need to write in front of THEM! After all, I already know I need to model writing instruction and I already know I want them to write and write and write. So I guess I better put my money where my mouth is. I got this amazing idea to actually compose a few paragraphs that I need to add to a journal manuscript in front of them. They can then see my process and I can think aloud all of the stuff that goes on in my head when I write. And it’ll be authentic. It’s not a piece that I made up to write for their benefit– I actually need to do this. Like Regie said it would, as soon as I thought of this cool idea, it immediately scared me a little. Which means I will absolutely be doing it. I welcome any tips for those that regularly write in front of their students. What’s the experience like?